It’s time get on your bikes and ride! Or if you don’t have a road-ready bike, you can rent and ride. Here are some options in the area to ride, rent and ride, or rent, ride and get a guide to some of the great routes in the area. 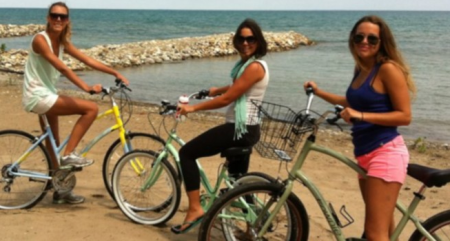 Georgian Bay Cycling Tours offers scheduled guided tours, custom cycling tours and B&B cycling tours. Bike rentals are available by request ahead of time, and tour leader Pete Russell also offers road cycling clinics to help newer riders bone up on their riding and minor repair skills. Blue Mountain Resort’s downhill cycling trails get all the notice, with the armoured downhillers cruising into the Village, but Blue Mountain also offers challenging (you get to ride UP the hill, too) cross country trails for mountain biking. And they also recommend the Pedal/Paddle along the Apple Pie Trail, which includes a gondola ride up the mountain to get you started, mostly flat and downhill riding, a kayak rental and paddle on the Beaver River. Bike rentals are also available. During a long cycle down the Beaver Valley last summer, we caught a glimpse of a rustic hand-lettered sign by the side of the road. “Hard Cider”. While we knew better, we had images of a grizzled farmer filling a gallon jug of his homemade hard apple cider while keeping an eye out for the “revenue man”. Somehow, we managed to miss the more professionally prepared sign at the lane just down the road. Beaver Valley Orchard and Cidery opened its doors last August in a beautifully renovated barn on the Beaver Valley vacation property John Mott and Judy Cornwell bought in 1997. 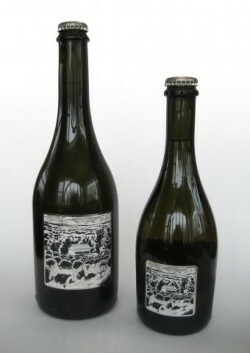 The couple released the first batch of deliciously dry cider from the Autumn, 2012 pressing last year, even as they began pressing the second year’s batch. In 2007, John and Judy visited a small wine region in Australia and were captivated by the ambience of the small wineries they visited – where the owners would come in from the vineyards to pour wine and talk to customers, then head back out to tend the grapes. It meshed perfectly with the dreams they’d long had of finding a way to live full-time at the farm while earning a living. Judy and John spent 2008 pulling rocks from the fields where they planned to plant the orchard, and the trees went in the next year. 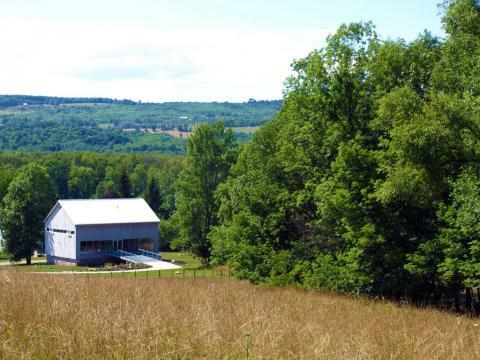 After a year or so of planning and design, working with Kimberley architect Peter Ferguson, they began renovating the barn as the cidery and visitors’ area, finishing in 2011. And in the meantime, they were perfecting their cider-making skills and their recipe. The couple travelled to the UK and to Washington state to take courses from Peter Mitchell, an internationally recognized cider guru, and experimented with different apple blends and yeasts to make batches in small 23-litre carboys. By 2011, they moved from “kitchen-table” batches to the industrial level equipment they’d installed in the barn, and began making larger batches. They were ready to create their first batch for sale in 2012. 2012 turned out to the worst apple-growing year in memory, with early warm spells and a killing frost, and the couple lost their crop. But fortunately, while the apples that did survive locally weren’t attractive enough for eating, they were just fine for cider. They bought the same varieties from local growers (a practice they’ll continue along with using apples from their own orchard), and made the first pressing of Beaver Valley Cider. The result is a very dry and refreshing cider that’s truly distinctive from other dry ciders. And while it’s not available in your local LCBO, you can order online at the cidery’s website. 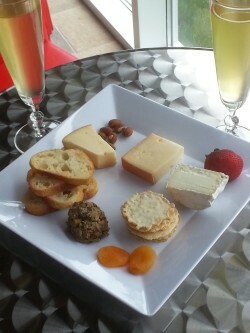 But better yet, enjoy a visit to the cidery for a tasting, perhaps enhanced by a tray of perfectly paired artisanal cheeses and homemade paté. Then take home a few bottles of your own. Last time we ventured 10 minutes East to Thornbury Village Cidery. For the second stop on the Meaford Cider Tour, we’re heading 10 minutes in the opposite direction. Take Highway 26 to the 2nd Concession and turn right (North). 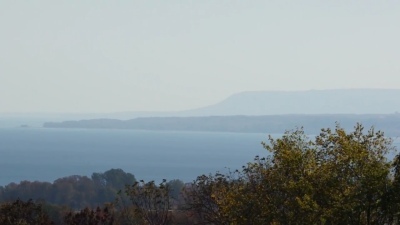 Seven kilometres along the road, you’ll discover a sweeping view of Owen Sound Bay and Griffith Island to the North. Nestled to your left is the black and red Coffin Ridge Winery, with a spacious deck overlooking the view. 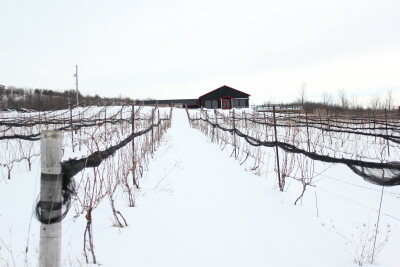 While Coffin Ridge is gaining a considerable reputation for the wines made from it’s Georgian Bay vineyards, you mustn’t forbid yourself a taste of Forbidden Dry Cider. This cold-pressed cider releases the fresh, crisp flavour of the organic Grey County apples used in its crafting. Coffin Ridge held its inaugural “Cider Release and Pig Roast” last month, with a (chilly, but sunny) outdoor performance by local favourites, The MacKenzie Blues Band. At the event, they introduced the new black, red and silver Forbidden can, which replaces the traditional “lightning-stopped” bottle the cider originally came in – and announced that for the first time, Forbidden is now available at selected LCBO stores. Coffin Ridge is open throughout the summer, and beginning tonight, is open till 9 p.m. on Friday nights, with vinter’s plates served till 8. It’s a perfect chance to catch the sunset over the Bay while enjoying the fruits of the local harvest. No reservations necessary. And beginning Saturday, July 12 through September 13, the Saturday Summer Music series will entertain you from 2 to 4 p.m. Check the website for more information and hours – and sign up for the mailing list to stay in the loop. mation and hours – and sign up for the mailing list to stay in the loop. 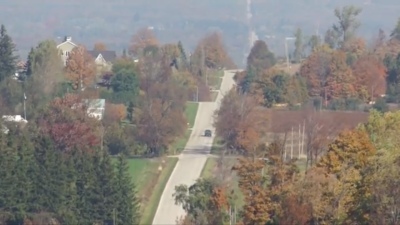 If you’ve had enough of this long hot summer, and are getting in the mood for a Meaford autumn, we discovered a nice video by “drofluf” down at the bottom of this post (with some stills from it gracing our page). We came across this video by the mysterious drofluf (who is also apparently an avid cyclist), which showcases some of last year’s fall splendour. He (that’s an assumption we’re making) was testing out a new long lens for his video camera, so there’s a lot of nice pulled focus and selective focus shots (check out the Canada geese!). And note the shot of a jet overhead. The crickets drown out its distant noise. Something else you notice when you live in quiet Meaford: while you’ll sometimes see distant planes and contrails, you rarely actually hear the airliners – they’re too far away. Continue along the road and down into the wide Beaver Valley until you reach the stop sign at Grey Road 13, below the looming face of Kimberley Rock or “Old Baldy”. Turn right here, and proceed through the quaint hamlet of Kimberley before climbing back out of the valley toward Eugenia. The Beaver Valley Lookout on your right might be worth a stop to enjoy the view. Then, through Eugenia until the stop sign at Grey Road 4. Turn left, and head east for 10 minutes or so until you reach another stop sign at Highway 124. Turn right here, and about 8 kms. later, turn left at Simcoe Road 9. This winding road descends through tree-shaded curves to the village of Creemore. A right on the main street of town, Mill Street, brings you to the Creemore Brewery. Back in 1987, retired ad man John Wiggins decided the town’s old hardware store, which he owned, would make a perfect place for a brewery. A friend, who was a retired bottle manufacturing executive and soon-to-be-co-founder, had an artesian well on his Creemore property. Another partner, also retired, who happened to be a pipe fitter and welder – handy for all that copper equipment – came on board, and the team hired brewmaster Doug Babcook to create the original Creemore Springs Premium Lager. Creemore Springs opened its doors on August 15, 1987 (which makes its 25th anniversary just a few weeks away), and the original batches of beer sold out in four hours. But as the beer was welcomed throughout the province (and eventually Quebec and Alberta, and even further afield), the brewery expanded to accommodate. Your blogger enjoyed his first taste of Bohemian-influenced Creemore Lager a year after its launch during a visit to Collingwood, and declared it delicious. But more reputable beer tasters were already noticing. 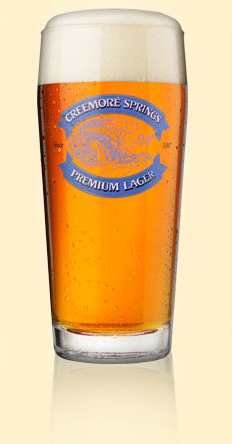 Michael Jackson, world-famous beer writer, soon declared Creemore one of the two best lagers in North America (the other no longer exists). Since then, the brewery has introduced such beers as it’s UrBock, a heavier winter beer, launched in 1996; a Pilsner, introduced as a summer beer in 2007, but now made year-round; and Kellerbier, an unfiltered German-style beer, first produced in 2009. In 2005, beer giant Molson bought Creemore, but the distinctive brews continue to be produced in the village, and the quality and flavour of the beer doesn’t seem to have suffered. 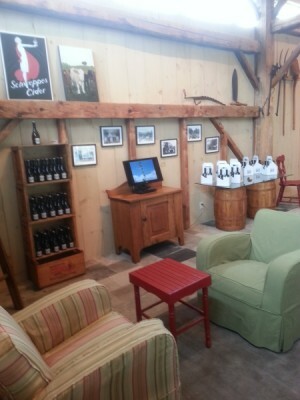 Take a tour of the brewery while you’re there, and enjoy a sampling of the Creemore offerings. And don’t forget to bring some home with you. With beautiful sunshine and summery temps predicted for Thanksgiving weekend, this is the perfect time to enjoy the vibrant fall colours of the Beaver Valley from the vantage of a canoe or kayak on the Beaver River. The river meanders gently through the Beaver Valley, curving through forests and meadows making a delightfully relaxing paddle for everyone, from beginners on up. And with three access points, you can choose the length of your journey. In addition to the fall colours, you’ll likely catch glimpses of wildlife, and if you like, you can drop in a line. Upriver, the highest access point is just north of Kimberley west off the Beaver Valley Road (Grey Road 13). For 10 kilometres, you wind through mainly mature forest, shaded by large hardwoods. While seeming wilderness, the foliage is quite a bit different from the northern paddling most Ontarians are used to, making it a unique experience. You’ll likely encounter the odd log jam, but don’t worry; if you can’t pull the boat over, your portage won’t be more than a few yards. When you reach the next access point near the Epping road, or when you put in here, you’ll see the canopy open above you, drift through more open spaces with views of the valley, and enjoy the odd slightly swifter current. The Heathcote dock is on the right bank before the bridge. You can pull out here, or continue through the hamlet to “Slabtown”, a favourite swimming hole. You might encounter a few small rapids and eddies in this section, before you pull out on the left bank before the dam. Find more paddling info and maps here. And you can rent a canoe or kayak, and even book a guide and learn some tips at Free Spirit Tours. The first flares of fall have caught our eyes in the last few days, as a few eager maples show their autumn colours early. 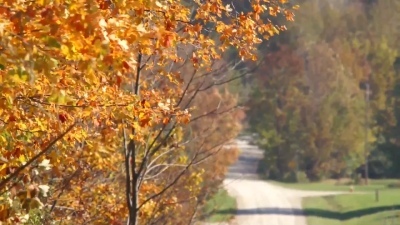 While the Beaver Valley drive, just a few minutes south of Meaford, is great at any time of year, an autumn tour of this grand, scenic vale should be in your plans for the coming weeks. To whet your appetite, check out the video. Stock up in town for a picnic lunch at Eggcitement Bistro, McGinty’s, the Earth Harvest Café or The Kitchen, or plan a stop in Eugenia, up the far side of the valley, for a quick bite at the Eugenia Falls Emporium or a delicious meal at the Flying Chestnut. Apple season’s here in the “other Big Apple”. 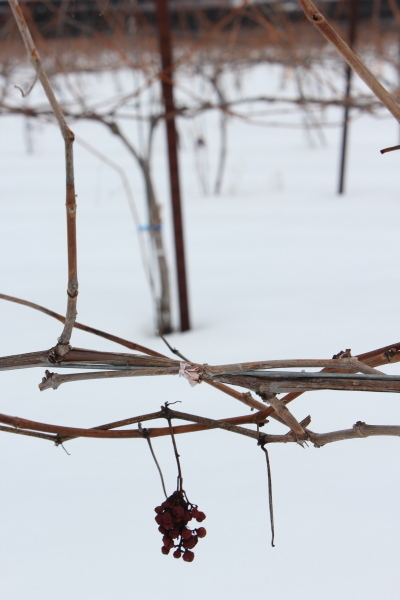 The orchards lining the roads around Meaford that were white with blossoms a few short months ago are now heavy with apples, and the farmers’ markets and fruit stands are displaying their ripe, red wares. We picked up our first half-peck of Jersey Macs the other day to bake up some apple crisp, but there’ll be many more varieties available in the days to come. Take a country drive around the area, and visit one of these country markets to get your apples (and much more). Home baking, jams, birdseed and gifts. Picked organic apples and more. On-farm market June through November. Apples, pears, plums, pumpkin squash and more. Eight varieties of apples stored in a controlled atmosphere. Ready picked apples and more. 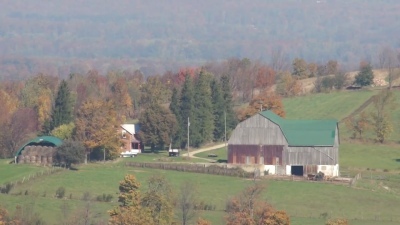 Minutes south of Clarksburg, pick-your-own or ready-picked apples, fresh-grown in season vegetables, baked goods and crafts. Apples, fresh pressed cider, non-alcoholic sparkling apple ciders, jams, jellies and preserves, maple syrup, honey, and apple gift boxes. On-farm market open July to December 9. 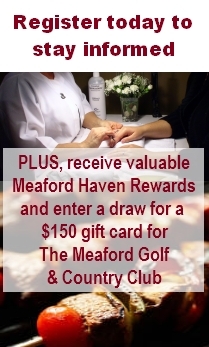 Fruits and vegetables, baked goods, honey, maple syrup, gift baskets, candles, and more. 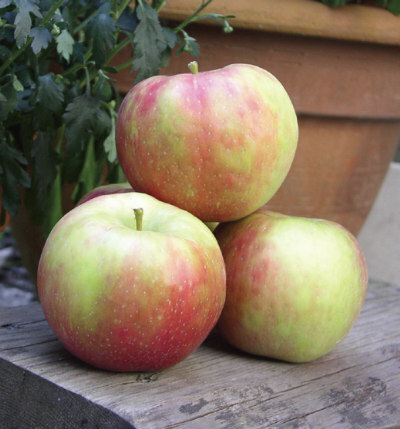 Cider, apples, jams, maple syrup and fresh produce, September to December Saturday and Sunday, 9 a.m. to 6 p.m.